It’s Fall, and it’s time to celebrate our Anniversary with you! As part of our weekend storewide sale, we’ll offer fun-filled Mystery Bags, gifts with purchase, many beautiful raffle gifts, and delicious treats! Don’t miss this year’s celebration of YOU, and seven years with our fabulous community. Read below for all the festivity details! Please note: We will close at 3pm on Friday to transform the shop for the weekend celebration. Friday Evening, November 2 - This event is FULL! Kick off our Anniversary Weekend with early access to our storewide sale from 5:30-6:30pm. After you’ve found those special yarns and holiday gifts in the shop, join us for a Dessert Social in the Learning Studio from 6:30-8pm. Bring your knitting or crochet project, your enthusiasm, and show off your favorite AYLR projects. There’s no fee to attend, however, we have limited space so your RSVP is required. Click here to register or call the shop. Shop the sale early for best selection. Reveal what’s in your Mystery Bag. Savor light refreshments and delicious treats from Cafe Atilla. Bring a project to knit or crochet, and visit with your A Yarn Less Raveled community. 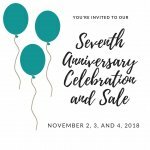 You’re invited to join us for our annual storewide sale, with more Mystery Bags, tasty treats, gifts with purchase, raffle entries with purchase, and much more. You’ll find even deeper discounts on our “Last Chance” sale table. Don't miss this opportunity to find holiday gifts, stock up on your favorite yarns and supplies, and save money in the process. In addition to the storewide discount, you'll find some amazing yarns at a deeper discount, and Mystery Bags will add to the fun! Choose your bag and enjoy lovely yarns at magical savings! Every customer will receive gifts with your purchase, and you'll be entered in a raffle for many generous gifts from our suppliers! We are so grateful for the generous raffle donations from many of our vendors, including Anzula, Blue Sky Fibers, Della Q, Fiber and Hue, Magpie Fibers, Shibui, Skacel, YOTH, and many others! We will be open from 10am to 5pm on Saturday and from 11am (special time) to 4pm on Sunday. Don't forget to set your clock back on Saturday night before you go to sleep! ALL SALES ARE FINAL on products sold during our Anniversary Event (Nov. 2, 3, and 4). Discounts are not applicable to Gift Cards, classes, or any already-discounted products. Discounts may not be applied to special orders, holds, or previously purchased yarn (returns or exchanges). Sale items are limited to stock on-hand and only for in-store sales. All personal services, including yarn winding, project assistance, and Ravelry pattern purchases, will be deferred until AFTER the event weekend. Limits apply to raffle entries, Mystery Bag purchases, and gifts with purchase.